Suitable for automatic packaging materials like all kinds of fried food,potato chips, shrimp,sweets, chocolate,biscuits,peanuts,rice,grain,seeds,pistachio,coffee beans,lima beans,tea,frozen food, sugar,salt and medicine. Imported PLC control system, simple-operating, visual touch screw. Servo film feeding system, correct register, sealing and cutting positions adopt automatic correction device, high automation. Intelligent temperature controller is used, correct temperature control, ensure nice, smooth seal. 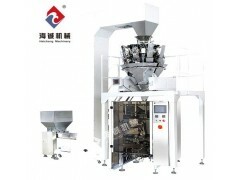 When the machine is combined with metering equipments, full packaging process including automatic feeding, metering, bag filling, date printing and automatic counting is completed. pillow bags, punched hanging bags.